Hydropower is one of the best generating options. In fact, a complete life-cycle assessment shows that its greenhouse gas (GHG) emissions are very low. For instance, a hydropower plant with a reservoir in a northern area emits 10 grams of carbon dioxide (CO2) per kilowatthour produced, the same quantity as wind power. Solar power, generated via photovoltaic panels, emits four times more GHGs, and a coal-fired power plant produces 100 times more GHG emissions than a hydropower plant. In fact, thanks to our use of hydropower, in 2009 the electricity sector accounted for only 0.6% of GHG emissions in Québec. A remarkable performance! In Québec, transportation is responsible for 44% of GHG emissions. Eventually, electricity will be able to replace a significant portion of the petroleum products used as vehicle fuels on our roads. This electrification of ground transportation will have a major impact on Québec's environmental track record and on neighboring markets. Thanks to its low GHG emissions, hydropower is an excellent way to fight climate change while supporting sustainable development. Are reservoirs a source of greenhouse gas emissions? In 2004, 154 countries recognized hydropower as a renewable source of energy. Since the source of hydropower is water from annual precipitation over a vast area, it is considered inexhaustible. 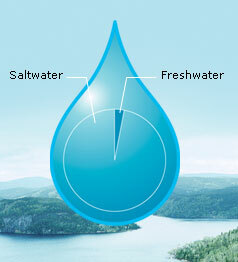 In fact, water follows what is known as the hydrological cycle, described below. The sun heats up the oceans, lakes and rivers, producing water evaporation. The resulting water vapor rises in the atmosphere where it condenses and produces clouds. When the weight of the water droplets or ice crystals which make up the clouds becomes too heavy, the droplets or crystals fall on the ground in the form of rain or snow. In this way, water returns to the earth and flows into lakes, rivers and oceans, and the cycle is repeated. Hydropower involves fewer energy losses during the generation process. In comparison, the transformation of fossil fuels, such as oil, natural gas and coal, usually leads to substantial losses in the form of heat. For example, when coal is burned to generate power, two-thirds of its energy is wasted. Water, on the other hand, is used to the last drop as it pushes against the blades of a power station turbine. In fact, it's one of the most water-rich regions in the world. It boasts over 130,000 rivers and streams, and one million lakes. 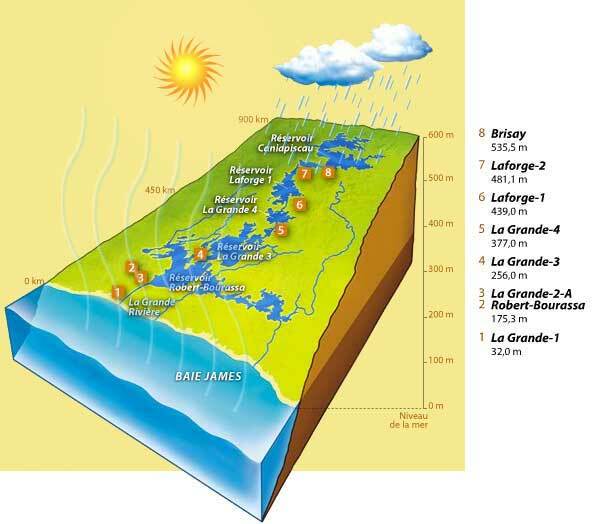 Over 40% of Canada's water resources are in Québec. Surface water reserves in the province (natural lakes and reservoirs) cover approximately 12% of its territory. Water is the most abundant substance on earth, covering three-quarters of the planet. Saltwater accounts for 97.5% of the total. Of the remaining 2.5% (freshwater), only a third is economically accessible. *Taken from a study presenting typical North American results for the same quantity of power generated. Each of the GHGs under study was converted into its CO2 equivalent. This life-cycle assessment, conducted in 2001 by Hydro-Québec, takes into account all the emissions of an energy system, from construction to removal from service. At the La Grande complex, water flows through the turbines of eight generating stations no less than seven times. This means that the same water generates electricity seven times before emptying into Baie James. A greenhouse gas (GHG) is a gas present in the atmosphere, of natural or man-made origin, which absorbs and reflects infrared rays coming from the earth's surface. The increased concentration of greenhouse gases in the atmosphere, such as the gases targeted by the Kyoto Protocol (carbon dioxide, nitrous oxide, methane, sulfur hexafluoride, fluorinated hydrocarbon, perfluorinated hydrocarbon), contribute to climate change. Energy whose production and use generates very little to no pollution. According to the Political Declaration issued by the representatives of 154 countries that participated in the International Conference for Renewable Energies held in Bonn in 2004 (Renewables, 2004), renewable energy sources and their related technologies include solar energy, wind energy, hydropower, biomass energy (including biofuels) and geothermal energy. Energy whose source is renewed or regenerated naturally and available in very large quantities compared to the needs of humanity.